I still do not understand my crafty soul. I seem to work in strange spacings. For weeks and month, I started one new project after the other but never finish them. And suddenly there is this one project which I work from start to finish. This one project is like a starting signal to unbury old projects and finish them. 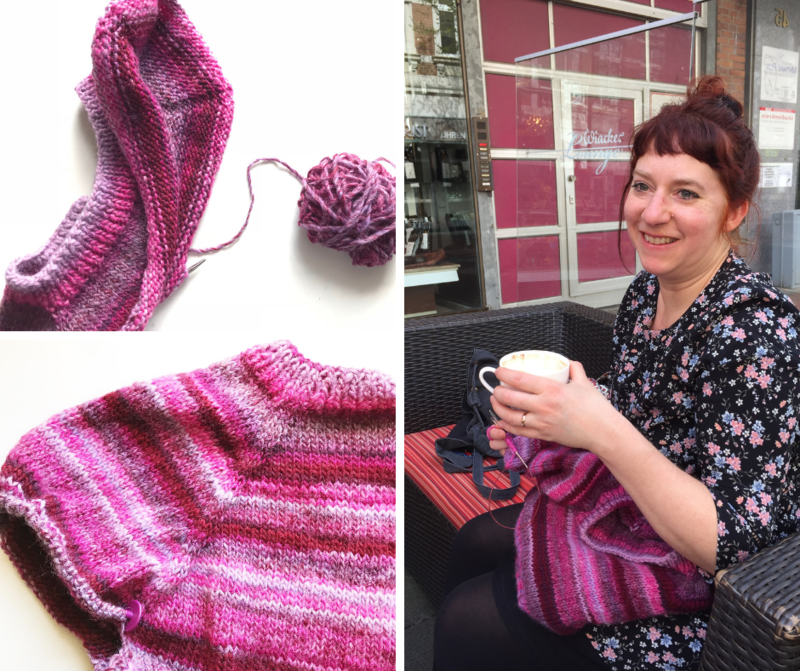 Last summer I presented you many half-finished problematic sweaters and cardigans in my post of shame. And I am proud to tell you, some of them are now finished and in use. I already showed you photos of my mother’s lace shirt and I completed the too big and the too small Miette cardigan. But I never told you the story of my Pipipink Sweater. This sweater is a simple top-down raglan construction. I thought the yarn so beautiful, that I did not want a complicated design. Just stripes and fast forward sweater. Simple. Just a sweater. And then I started to browse on ravelry and found so beautiful vintage inspired sweaters with puff sleeves. Like Anette Mielche’s free pattern Miss Bennet Puffed-Sleeved sweater or Susanne Crawford’s Trimmed with roses jumper. You know where this lead. I half hearted changed my ‘simple’ sweater into a puff sleeve sweater. 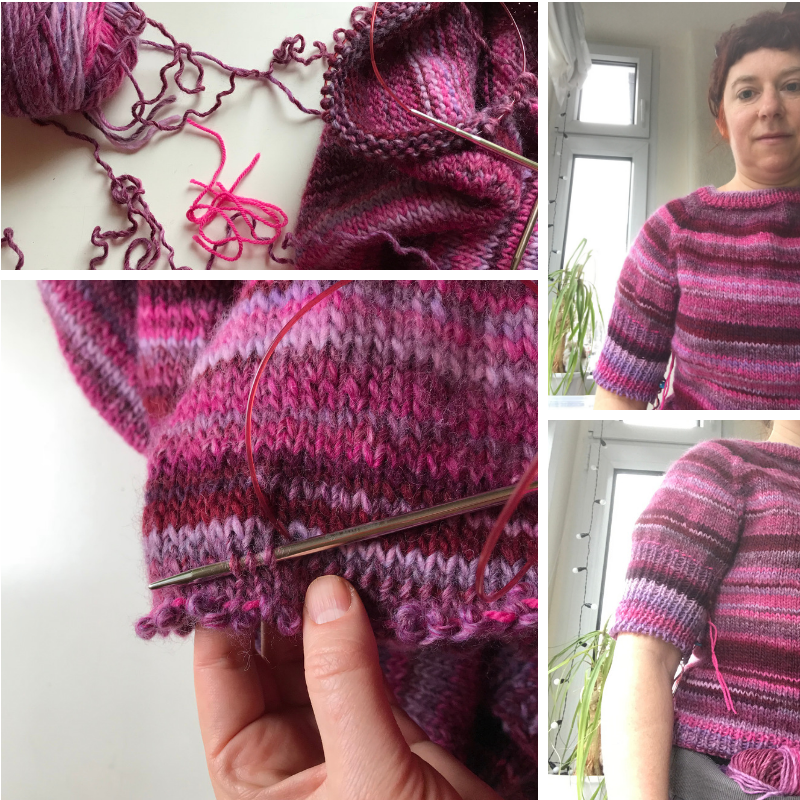 As it is a top-down construction, I thought, I will make simply wider sleeves and then start the ribbing high up. I did not occur me to read how puff sleeves are made. So, after finishing the body, which fits surprisingly well, I dedicated myself to the puff sleeves…. which had no puff at all, they simply were too wide sleeves: AHHHHH And I must admit the tight ribbing on my upper arm was less than flattering. So on to the frogging. Clever as I am (or perhaps I am only used to making stupid mistakes) I had inserted a lifeline, so I could unravel securely. But as I am not clever enough, I had inserted it not high enough. As you can see on the photo, I used a technique to unravel where you insert your needle into one leg of every stitch and only then do you pull the yarn out. After this failure the sweater slept for month in a box. But finally, I got this rush and with some other things finished it. It still has too wide sleeves at the upper arm and armpit and the front part of the neckline is too high up, but its ok to wear. Actually, I wear it a lot. Perhaps the beautiful shades of pink compensate the fit issues. c) want to have a wider and more cropped look. 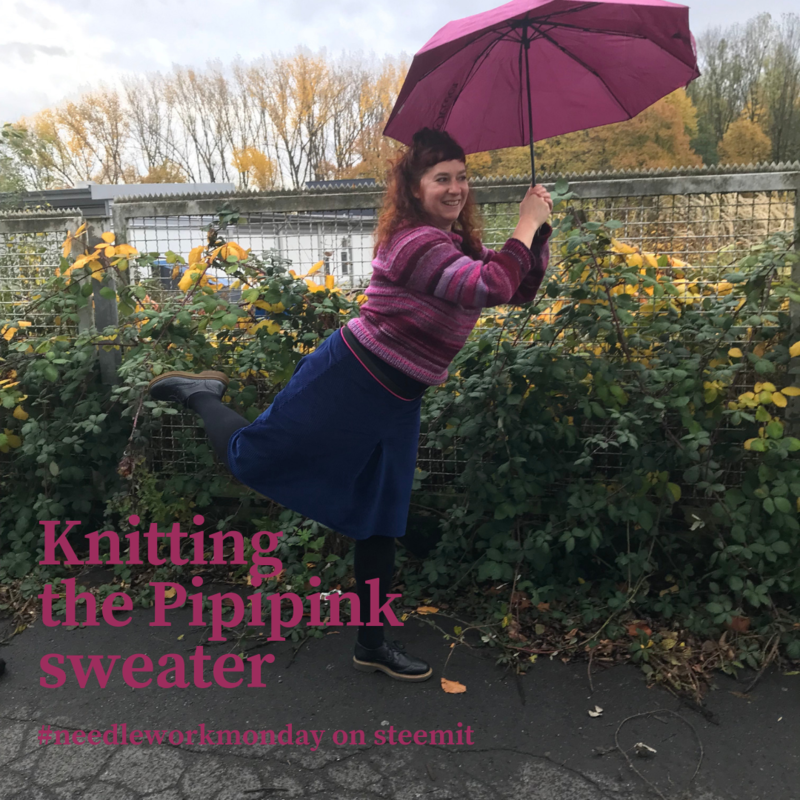 If you want to see more beautiful projects with yarn, fabric and most of all needles, follow @needleworkmonday. Or even better grab your needles and keyboard and join the #needleworkmonday community. If you want to read all the comments read this post on my steemit blog.